The rain is gone, but cool temps and blustery winds are sticking around. Some spots around the D.C. area received more than an inch of rain Thursday, from a storm system expected to become a major nor'easter as it moves further up the East Coast. The storm is expected to become a major nor'easter as it heads to Long Island and southeast New England. When it does, it will have an effect on our weather in the form of very gusty winds Thursday night and into Friday. 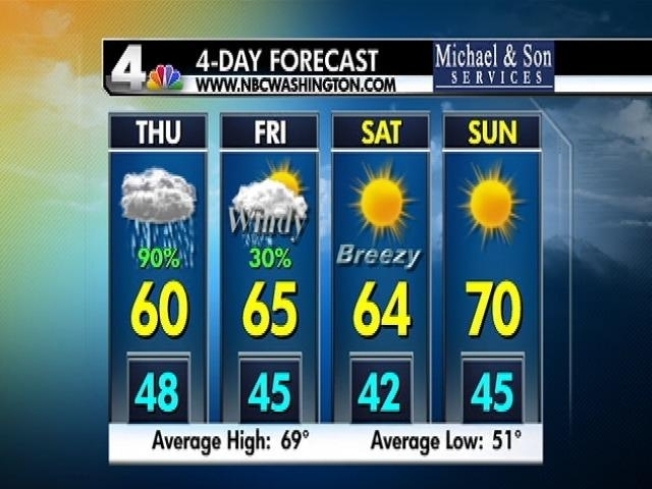 We could feel gusts of more than 30 mph Friday and Saturday, said NBC4 chief meteorologist Doug Kammerer. The system also could lead to fallen trees and flight delays Thursday night and Friday, from Philadelphia to New England. The rain our area received today was much needed. The region was once again drier than average this month, but today's rain puts us near normal for the month. Looking ahead, the weekend is shaping up. Friday will be blustery and cool, but with highs reaching the mid-60s. It will be chilly Saturday morning with lows near 40 degrees -- the chilliest of the season so far, said NBC4 meteorologist Tom Kierein said. The sun will come out, however, and the highs will reach the low 60s. That's still cooler than average for this time of year. Sunday looks great. It will be sunny with temperatures in the mid-40s in the morning and near 70 by mid-afternoon. And the weather for the Redskins-Colts game Sunday night: clear skies and temps in the low 60s at game time.